Is this a possible route in your point of view? Easter island? Thank you for making such a fantastic homepage - letting us all get a glimpse of how wonderful life can be! 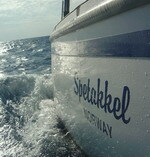 Your webpage among others have inspired us to take a year out of our calenders and challenge the seas!.. We are four friends planning one years sailing across the Pacific Ocean. We do not have that much experience with sailing, but are comfortable with doing the trip. After significant research we are left with a couple of critical questions that we haven't been able to answer - maybe because there are no "correct" answer at all! We write this mail to you in hope that you will be willing to share your insigths and points of view with us. Is this a possible route in your point of view? We hope that you will be willing to help us by providing your thoughts. In that case we will be more than greatful. Thank you for an encouraging letter, I have stopped making my page on advice but you are inspiring me to continue. I don’t have the cornell bible here with me now but I was the first to leave Bora Bora this season and that was in the end of April and it was great to be the first one to arrive in Aitutaki and Palmerston this season. 1. Unfortunately the route you have chosen to go down to Easter island is quite hard and I would not recommend it, it is just too hard to sail that way, also you will experience Gambier instead of Marquesas. The Marquesas is 'special' and different from the other French Polynesia. I would really have loved to go to Easter island too and should have done what by plain, leave the boat in Tahiti for a week and fly down to Easter island, that is one of the two possible airways to get there and it is cheap, about 600 USD with airfare and hotel (can be 1000) but worth it and it will be cheaper than sailing over 3000 miles extra. 2. Pitcairn?, well forget it, it is not even possible to land a dingy. You have to wait for the locals to get you and you can only stay there for a few days because of the rough seas, sorry but I would say forget it. SPEND MORE TIME IN GALAPAGOS INSTEAD, Galapagos is heaven, and you will love it. You can get a two month permit (to stay in the 4 ports) from Naugala yacht agent (tell him kjell from Norway sent you and he will lower the price). It is worth every penny to stay in Galapagos. 3. DO NOT sail straight to Panama; you need to go to the Kuna Indians in San Blas first, that is a Must. 4. It is not easy to see both Aitutaki and Rarotonga, go to Aitutaki and then call into Palmerton on the way out, it is the most scenic and the most 'logical' route to go. 5. Most people go the same way at the same time when crossing the Pacific and there is a reason for that. Even though there are lots of weather-windows to go in the off season the weather in general is much much better in the right season but varies year by year. Time is the most important factor for most people, if you have it i would stay the first hurricane season in French Polynesia (6 months) and then be the first to leave Bora Bora in the end of April or beginning of May. That will leave you plenty of time for the Pacific.